Wait a minute! It’s not Saturday! It’s not our cheat day! BUT what would Valentine’s Day be without a decadent dessert to share with the ones we love the most? Naturally, the best way to the heart is through the stomach, so we decided to combine a few recipes to make the ultimate Cupid worthy treat. 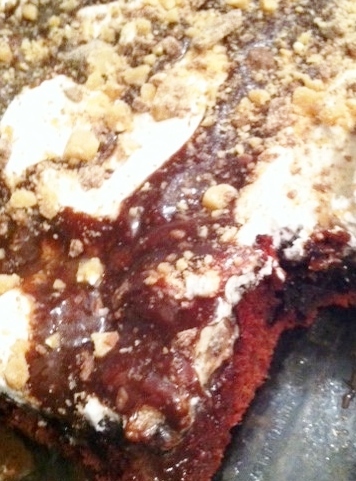 Gooey Butter Red Velvet Poke Cake Brownies will make your taste buds dazzle and your heart smile. We hope you have the sweetest Valentine’s Day! Preheat oven to 325 degrees F. Combine cake mix, melted butter, eggs, pudding mix, and vegetable oil and mix well until thoroughly combined (2-3 minutes on medium of electric mixer). Spray a 9×13 pan with non-stick cooking spray. Then spread the red velvet cake layer into the pan. It will be VERY thick, so use the back of a spoon (or clean hands) to help spread it into all edges of the pan. Bake in preheated oven for 25-30 minutes. Remove from oven and allow cake to cool for at least 15 minutes. When the cake and brownies are baking combine can of sweetened condensed milk and 1/2 jar of hot fudge in a non-stick pot and melt on low on the stove top until well mixed. While the cake is still warm, take the end of a wooden spoon or another round object and pok.e holes all over the top of your cake. Pour can of sweetened condensed milk/hot fudge mixture over the top of the brownie cake. Sprinkle 1 cup Heath bits on top. Allow it to absorb in the cake until cake is completely cooled. When cooled spread Cool Whip on top of the brownie cake. Heat the remaining 1/2 jar of hot fudge in the microwave and swirl on top of the Cool Whip. Finish by sprinkling remaining Heath bits. Pure Indulgence!